(CNN) - Alaska Sen. Ted Stevens has conceded defeat to Democratic challenger Mark Begich in the Alaska Senate race. Stevens, 85, was the longest serving Republican senator in the chamber's history. “Given the number of ballots that remain to be counted, it is apparent the election has been decided and Mayor Begich has been elected," Stevens said in a statement. “My family and I wish to thank the thousands of Alaskans who stood by us and who supported my re-election. It was a tough fight that would not have been possible without the help of so many Alaskans – people who I am honored to call my friends. I will always remember their thoughts, prayers, and encouragement." “Given the number of ballots that remain to be counted, it is apparent the election has been decided and Mayor Begich has been elected. “My family and I wish to thank the thousands of Alaskans who stood by us and who supported my re-election. It was a tough fight that would not have been possible without the help of so many Alaskans – people who I am honored to call my friends. I will always remember their thoughts, prayers, and encouragement. “I am proud of the campaign we ran and regret that the outcome was not what we had hoped for. I am deeply grateful to Alaskans for allowing me to serve them for 40 years in the U.S. Senate. It has been the greatest honor of my life to work with Alaskans of all political persuasions to make this state that we all love a better place. OK Ted. Now get ready to do some jail time. It will be well deserved. Good riddance. Hopefully Alaskans will show Sarah Palin the door next election cycle as well. Aren't you going to follow Palin's lead and at least congratulate the new Senator Begich??? Finally, let him exit stage right. See you in court Stevens. I HOPE HE DOESN'T DO ANY JAIL TIME. GOOD LUCK WITH YOUR LIFE DUDE! LIKE FRED SANFORD (REDD FOXX) WOULD SAY, "PEACE AND HAIR GREASE". Stevens ain't goin' to prison, y'all. Bush will pardon him for sure, along with any other Republicans - donors, cronies, child molesters, etc. - that need one. "Does a polar bear, well, you know, in the woods?" Actually I don't think they do, but the lipsticked Pit Bull with a Narcissistic Personality Disorder will most definitely hold a press conference. After all, it is all about her. Exactly where was my history lesson in that mess? Good to see this guy gone. 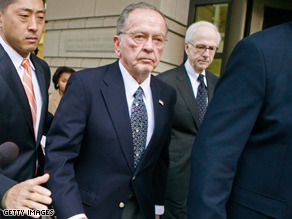 Not trying to be mean here, but when an 85 yo guy clings to power like Ted Stevens did till yesterday or so, that speaks volumes...and makes one suspicious and dissappointed at the same time. The only thing in his favor: not seeking Bush's pardon. Let him live the few years left of his life in peace. I don't want him in jail, he's too old for that, I just want a public apology and repent. One ugly corrupt man out the door. May he take his party and Palin with him. Thank god that she lost a window to inflict herself on the nation in the Senate. If I were her I'd take that book deal and get it out in a month or two. Send him to the old folks home, not prison. Now I hope he will spend every day of his life in jail, and that he won't be able to enjoy one cent of his obscene Senate retirement. Stevens is too old to go to prison. He should just go somewhere and sit down, try to enjoy the time he has left. His loss is good news, though. Every time I thought there was no way the Dems could make it to 60, they win a race. Two to go. Yes! Oh yeah and perhaps Sarah Failin can just, you know, go away now since we don't have to see her on the national scene as a senator. I agree, maybe not prison, but then again if it was any other ordinary Joe he would go so why not!!!! POOR SARAH!!!! I guess GOD didn't open that door!!! It's okay Stevens, time to take off the suit and put on the orange one, along with the handcuffs! Alaska, it's about time for a new Governor too, don't ya think? !